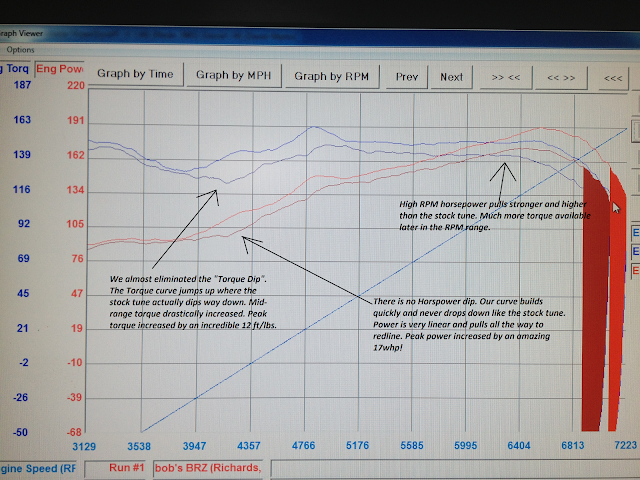 We just finished Pro-tuning a local BRZ 6mt, the car only has a drop in filter and a muffler delete, using 93 octane. We achieved a 17 wheel horsepower and 12 ft/lbs. torque gain over the stock tune! We drastically increased low and mid-range torque, as well as dramatically reducing the dreaded "torque dip". Peak torque was increased by 12 ft/lbs. to the wheels, We provided more torque throughout the entire rev range, and the torque curve after the peak is extremely flat all way to redline. Peak horsepower was increased by 17 to the wheels, and the curve is very linear and builds smoothly all the way to redline, power was increased across the entire rev band. We did away with the stock tunes HP "Valley", our horsepower curve builds steadily to redline, giving smooth and strong power delivery! Keep in mind, this is basically a bone stock car. We did back to back testing with the drop in filter vs. the stock filter and there was a +/- difference of 1 hp, it was negligible over the course of 2 runs each. Also, the muffler delete was shown to have zero affect on the power numbers, but it sounds damn good! We are very proud of this tune as these numbers are in the very upper range of what we have seen on a stock drivetrain 86. Our Priority was to achieve maximum useable power while maintaining complete reliability and driving smoothness. We did not tune this car to the ragged edge just to achieve a big number, that's not how we do things. For this customer we also enabled the Launch Control feature, which he really like for Autocrossing. This gives you a programmable rev limit, which allows for consistent launching, and sounds really sweet! Contact us for a Tuning consultation and we can set up a private tuning session or put together a tuning package that will perfectly suit your car and your needs! We will have an official "tuning for sale" thread shortly.